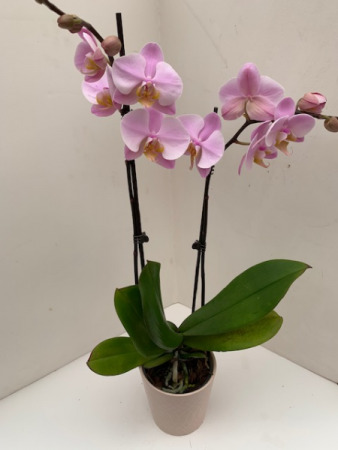 The most highly coveted of ornamental plants, the delicate, exotic and graceful orchid represents love, luxury, beauty and strength. 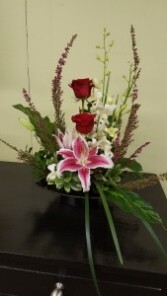 A stunning stylized arrangement designed with artistic flair. 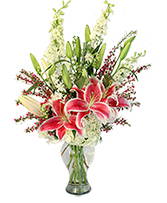 Stargazers, dendrobium orchids, roses and heather are the stars of this beautiful design. This is the perfect combination of love and romance. 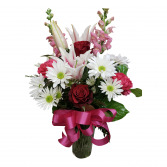 Filled with stargazer lilies, red roses, and pink snapdragons.